“Rooh” is the latest single by Bohemia set to release exclusively on iTunes July 1st, 2013. While abandoning his original, self-tailored genre of Punjabi Rap, Bohemia hits notes in “Rooh” that are bound to touch a chord. Bohemia’s personal past history is laid bare in the song. His attitude of weary surrender adds more chilliness to the atmosphere of the song. Bohemia’s frustrated words are the main ingredient which results in a truly brilliant, epic song of pain, regret, and a failing struggle for closure. The soothing music and gentle melody accompanying the chorus will make sure “Rooh” stands out as a true classic. Music is produced by the rising Prince Sahib. The video is shot by Element Productions and is set to release shortly. 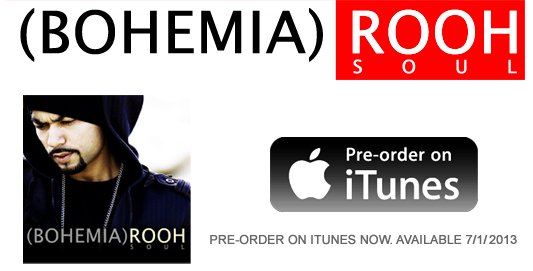 “Rooh” is available for pre-order on iTunes now.